When I was initially toying with the idea of Halloween martinis, it seemed overwhelming. There were too many various combination of ingredients possible and where would I find the time to test them all? Unlike trying various ingredients in food, martinis pose the additional issue of testing alcohol while maintaining a clear enough head to discern what is working and what is definitely not. Let’s start a test group! So I thought, why not spread the inebriation to get more done, more quickly? There were two approaches I wanted to try and just not enough ideas in my little brain to handle it all. After opening up the idea to Twitter, several vegans stepped forward eager to play with the two ideas: chocolate and pumpkin. Here’s a quick list of the other really fine, awesome, and patient gals participating in this challenge. You really should read all of the posts as they’ve all created their own variation of these martinis and THEN SOME! I’ll add more links at the posts become available. Two ideas for Creepy Halloween Cocktails. First up, we have an easy one that should be possible for anyone anywhere to pull off: a dark chocolatey martini that could be dressed up any number of ways for Halloween. The second martini was way more of a challenge for me personally. 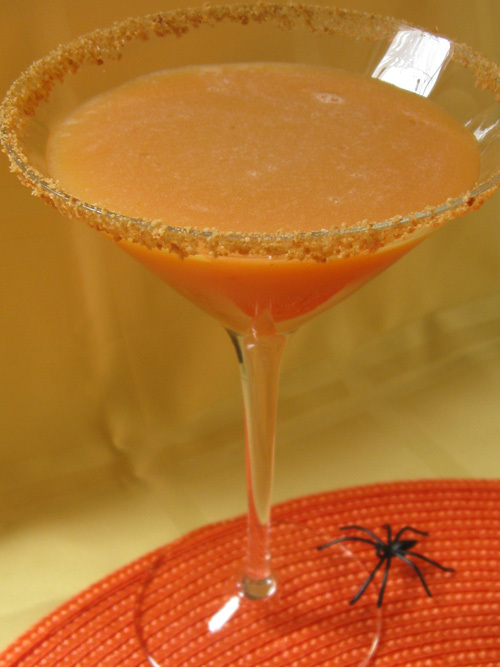 The problem that I wanted to solve was to create a vegan version of a pumpkin pie martini without the dairy products like cream, butter, etc. Thank Gaia for Barnivore! Without them I never would have found the vegan liquor ingredients for this harder-to-nail martini. Even so, I was initially headed down the wrong, wrong and SUPER WRONG path by wanting to incorporate rum along with actual ground pumpkin pie spices. Both of these are a BAD idea. The rum was too spiteful and didn’t add any value. The spices were too gritty to use in a martini. I wanted a smooth velvety martini, just like pumpkin pie. I even tried using a finely ground Ceylon Cinnamon from Penzy’s but it too, was too gritty. 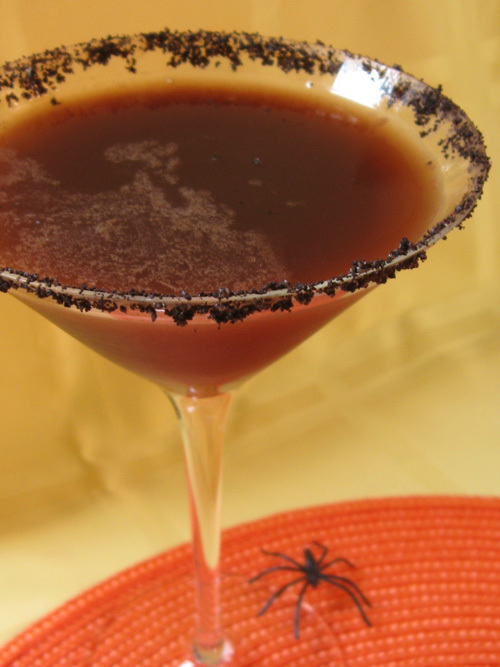 The only grit I wanted in my pumpkin martini was the Newman’s Ginger oreos I used to rim the glass. All other grit was unappetizing and—it turns out—unnecessary. Here are the two recipes. The chocolate martini is as it was, no changes. The pumpkin when through many trials and most of the time I spit it out in the sink. Not a pretty sight (fat vegan chick wearing a sleeveless red tank and corduroy derby spitting in the sink, yeah baby). But finally, what I ended up with for the pumpkin pie martini is awesome, IMHO. Rim the glass with Newman-O’s (or Oreos) chocolate cookies and set aside. A wipe of chocolate syrup will help them stick. Pour into glass, garnish with Halloween spookies. I did try this with soy milk added for a milk chocolate approach but it didn’t seem to add an value or interesting flavor. Plus I liked the looks of a darker martini; more chocolatey flavor. I am going to try this with a raspberry framboise liquor that I just bought today in place of the Frangelico. Orange would also be yummy. Might also try it with Van Gogh Dutch Caramel vodka to see if that’s more complex than a vanilla vodka. Rim the glass with ground-up Newman-O’s Ginger cookies. Use maple syrup on the rim to get the crumbs to stick. Shake, shake, shake and pour. Dress up your martini with Halloween ghoulies. I tried brown rice syrup but maple syrup added a nice flavor to the pumpkin pie idea. I also tried using actual pumpkin pie spices but they were too gritty for my taste. Using the Goldschlager instead allowed spiciness without the grit. I was skeptical about a 1/8 teaspoon but it really did work. Any more than that and you’d have a Jolly Rancher Fire Rancher. And about the rum, that was a bad idea. I have this romantic notion about rum in general being all butterscotchy and musky and it never quite lives up to that. Not sure where I got that notion but trust me, go with Schnapps or the Van Gogh. Using 2 ounces of Van Gogh Dutch Caramel vodka has more of a vodka-like edge than mixing the plain vodka with butterscotch schnapps. But I prefer the use of the Van Gogh, even with the pronounce alcoholic sharpness. The caramel is much stronger than the butterscotch. Both will get you equally hammered though. Regarding pumpkin puree, maybe it’s my imagination but I swear there is a subtle taste difference between Libby’s and the local grocer’s house brand. Libby’s is also more orange in appearance and makes nicer looking martini. Barnivore makes it all possible. I’m going to give a little plug here for one of the most indispensable vegan resources available: there’s no way a drinking vegan could get along without Barnivore. Seriously, I’m sure the liquor store folks wonder what the hell I’m doing on my iPhone while standing in front of the row of Schnapps. But I swear, I could not survive—well, could not drink anyway—without Barnivore. We should all send them money for the service they provide to vegans everywhere. Seriously. Thanks again for masterminding this whole thing! I had so much fun with it. Everyone I told was so eager to try the cocktails too! I am going to try your pumpkin variation tonight! Love your creativity with the garnishes on your versions! Really groovy! what a shame that I now have a huge bottle of rum to find a use for… ahem. Thanks for scooping us all up into your lovely little Halloween cocktail adventure! The Amaretto variation on the Frangelico Graveyard Smash was a real hit in our house but I’m still on the hunt for Frangelico in Vancouver! Happy Halloween to all the #creepycocktail crew, and all the ghouls and ghosties out there! Interestingly, after I mentioned on Twitter that rum wasn’t working in a martini, Happy Herbivore said she’d just had a rum/mango martini that was awesome. Maybe we can get a recipe from her? I’m also thinking now would be good to create a vegan hot buttered rum version. I loved hot buttered rum in the 80’s. Oh, and let’s not forget mulled cider and nog!